Social media is a powerful tool when it comes to marketing. Major brands have gotten it down to a science and thanks to their seemingly endless budget, they can spend a ton to advertise heavily across multiple platforms. Not to mention, they hire people whose sole responsibility is to run their social media accounts. What a job! 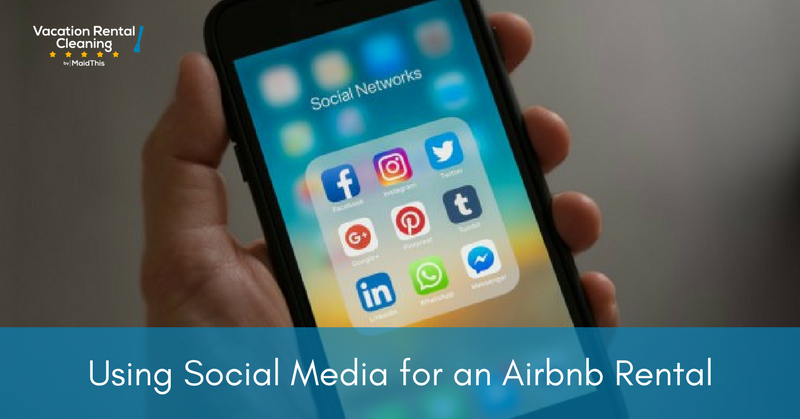 Here are the top social media platforms to consider and how they can help you drive interest in your vacation rental and, hopefully, lead to more bookings. If you don’t have a special account on Instagram for your vacation rental, you’re behind on the self-marketing game. Because so much of marketing a vacation rental is about images, Instagram is the #1 platform where you should be building a following and engaging. It’s the perfect place to post photos of your place (remember to use professional pictures), photos of your neighborhood, places you like to frequent or that you specifically recommend to your guests, and so much more. Thanks to the integration of video, you can now add even more interesting content. Just remember that this isn’t meant to be your personal account, so keep your content to things that would interest someone looking to rent vacation accommodation. So how do you go about using Instagram effectively? First, when you set up your account, include a link to your Airbnb listing or website in the bio. Because Instagram doesn’t play nice with links in photo or video descriptions (they don’t actually link so you force people to type in links to the browser, which they’ll never do! ), you need to make it easy for them to find you so they can book. To find interested potential guests, play around with hashtags, look at other accounts using similar hashtags, and start experimenting. It’s possible someone will find your place via hashtags and want to book with you. Ah, Facebook. The biggest social media platform on the planet. Though there are a ton of people on Facebook and it can be a great place to market your business, it can also be a giant black hole. With Facebook’s recent changes to newsfeeds and a stronger focus on personalized content and relationships, using Facebook to market your business may not be the best path for those with a single vacation rental. The key to making Facebook work for you is to engage actively with people who follow you (or, ideally, a page you’ve set up for your vacation rental – it’s a business, after all!). There’s a lot of power to Facebook, but for most hosts, we don’t recommend trying to spend too much time there. Instagram is likely a better platform to focus on. Instagram is, for vacation rental hosts, likely the best place for hosts to spend time and energy marketing their vacation rentals. But what about the other popular platforms out there we haven’t mentioned? Twitter may have some potential if you’re willing to put in a lot of effort and mostly will come about if you’re lucky with hashtags, but it’s not a place driven by photos like Instagram or helpful when it comes to search results like Google. If you’re in to sharing endless content and posting multiple times a day, we say go for it. But if you’re looking to get the most bang for your buck, we recommend skipping Twitter. Snapchat can be a lot of fun but its users are likely not the type of people you want to be marketing to. Snapchat has users across every age group but it’s most heavily used by young folks between 12-24, with 12-17 being the highest active age group. This audience will be more hit and miss and probably isn’t the best place to invest time. Unless you’re making a point to market directly to business guests, LinkedIn is no place for a vacation rental. This is especially true if you’ve only got one place to offer. There’s no reason why you shouldn’t use the platform for yourself as a professional, whether that be as a pro host or for another day job, but it’s likely not the best place to try and drum up a following or business. Social media is fun and can do a lot for your vacation rental business. If you’ve been on the fence, unsure of how best to utilize the platforms, or simply haven’t given it much thought, we recommend jumping online and getting started right away. Your next guests could be just one social post away! Need some help getting ready for your next check-in? Let MaidThis! help. We handle turnover cleanings for vacation rental hosts so your guests are comfortable and cozy from the moment they enter your home.